Meet the Beatles for Real: Meet Sara Schmidt ... for Real! Meet Sara Schmidt... For Real! Sara Schmidt is a 2nd generation Beatles fan that lives right outside of St. Louis, Missouri (U.S.A.). She started the site "Meet the Beatles...For Real" on March 9, 2009. She thought it would be fun to share Beatles photos taken by fans with a few of her Beatles friends. The blog was started to share those type of photos and the stories that went with them. She patterned her blog directly from the fanzines The Write Thing and With a Little Help From My Friends. Never in a million years did she think her little blog would get the world-wide notoriety that it has received. Sara has collected Beatles photos since 1997. She collects both physical copies and digital copies of Beatles (and solo) photos. She finds photos all over the internet as well as auction catalogs, books, magazines, and other often forgotten places. If you see a photograph that you own the copyright to on this site, please do not get angry and contact a lawyer until you talk to Sara (Starshyne9@yahoo.com) Sara does NOT make money from the site and wants to honor and respect your personal Beatles memories. Please know that the photo was posted here in regards to preserving the Beatles history and out of a true love for the four members of the band. If you would like to have your photograph removed, please email Sara at the address above along with the link to the post. Sara will remove it as soon as she can without any questions asked. 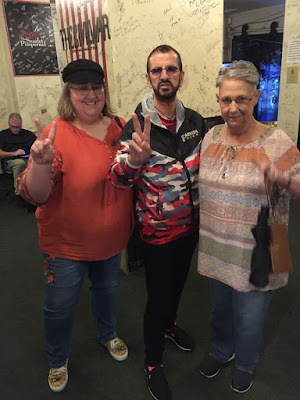 On September 7, 2018, Sara (and her mom) finally got to "Meet a Beatle...For Real"!!!!! Prior to meeting Ringo, Sara was able to meet other Beatle-people including Klaus Voorman! Sara is the author of the book Happiness is Seeing the Beatles: Beatlemania in St. Louis. She is also a contributing writer to A is for Apple Volume 2. Sara is currently working on her second book, Dear Beatle People: The Beatles Fan Clubs in North America 1963-1972. She has spoken at the Fest for Beatle Fans in Chicago and New Jersey and The Beatles at the Ridge in Arkansas as well as local libraries and museums. Sara is an elementary school Title 1 reading teacher. She loves to sing, act and travel to Beatles destinations around the globe. She lives with her boyfriend in a town in Southern Illinois, just a few miles from St. Louis, MO. Sara has never made any money from this site. However, over the years she has been asked by readers about how to make donations to keep the site going. It does cost to keep the blog running and ad-free. If you would like to donate to blog, you can help out by buying books through Amazon.com whenever you see an Amazon link (usually after a review) or you can donate with PayPal below. Hi Sara, I stumbled upon your site and it's (lol) really gear. Under Beatles People, would you consider adding Freda Kelly? She was The Beatles press secretary and ran the original Beatles Fan Club (see documentary film "Good Old Freda." I have Freda under "Amazing Beatle fans"
Go right ahead, just please rememebr to credit any photographer or copyright holder if it is given. Thanks! Hey Sara, you dont know me but I am friends with your boyfriend from youtube . I love you site ! I was wondering how he was doing because I have not seen him on the live chats anymore. Thank you SO much for contacting me! I was wanting to get ahold of his youtube chat friends, but I just didn't know how. Shawn passed away on February 8. I dont' want to go into details here, but if you want to email me at Starshyne9@yahoo.com I can tell you more. Love this site and the memories it brings back. That photo of the Beatles with myself and Bunny Castilano in 1964 seems like yesterday.